The nation's fastest growing textile recycler participated in a record 23 events across 8 states during Earth Month to educate communities on the impact of clothing & shoe donations. Wear it today, plant it tomorrow, and remember the importance of donating and recycling textiles all year round! ATRS Recycling fairies and mascots braved the April showers, thunderstorms and flood warnings that plagued the country last month to help Earth Day Network achieve its 2016 goal of 3 Billion Acts of Green. The nation's fastest growing textile recycler partnered with large scale citywide events, schools, airports and office complexes to celebrate this global tribute to the planet on April 22 and all month long. Earth Day promotes a range of sustainable calls to action, covering environmental responsibility, renewable energy, clean eating and local shopping. The ATRS mission is always simple and clear: reduce textile waste contributions to local landfills. According to Secondary Materials and Recycled Textiles (SMART) Association, the average American discards 81 pounds of clothing, shoes and other textiles each year. Currently, only 15% are donated or recycled, leaving approximately 69 pounds of usable apparel and footwear per person that is deposited in municipal landfills annually. The first step in reducing unnecessary landfill waste is to educate community members of all ages. ATRS Community Recycling Advocates directly engaged with approximately 3,000 eco-minded event attendees at 23 events throughout eight states during Earth Month. Easily recognizable in their familiar green mascot gear, these friendly characters distributed informative recyclable flyers, "I Heart Recycling" stickers for the kids and the company's ever-popular plantable wildflower bracelets. "Wear it today, plant it tomorrow," they challenged event attendees. "And remember the importance of donating and recycling textiles all year round!" ATRS offered free onsite Clothing & Shoe Donation services to expand the sustainability component of each of these events. Bins were conveniently located at event entrances and resulted in over 5,000 pounds of gently used, unwanted textiles diverted from 15 city landfills, a record breaking number for the company's Earth Day Campaign. These collections help several municipalities, including Orlando and Tucson, work toward their impressive diversion goals. Municipalities aren't the only beneficiaries of clothing and shoe donations at Earth Day events. Every pound of gently used, unwanted textile donations added to monthly funding provided by ATRS to local nonprofit partners. Earth Day Texas attendee donations benefitted Children's Medical Center in Dallas, and anyone who recycled their clothing at Diamond Bar Earth Day helped raise funds for Giving Children Hope in Los Angeles. Other events benefitted Susan G. Komen Central Florida, Colorado Adaptive Sports Foundation and several other deserving charities. 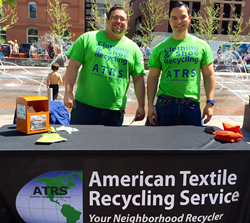 ATRS would like to thank the event partners and community members who made the annual Earth Day Campaign another huge success, and would like to encourage residents throughout its 13 markets to make clothing, shoe and household textile donations a habit not just during Earth Month but all year round. Residents, families and local businesses can find their nearest bin by calling the ATRS 24 Hr Hotline at 866-900-9308 or visiting http://www.atrscorp.com. Together, we can work toward a greener tomorrow! American Textile Recycling Service (ATRS) is the nation’s fastest growing textile recycler. Its socially responsible business model provides free textile recycling solutions for the public, job stimulation worldwide and much-needed funding for worthy local charities. Easy, convenient ATRS Donation Bins are available throughout Texas, Arizona, Atlanta, Colorado, Florida, Indiana, Michigan, Oklahoma, Southern California and Tennessee. ATRS is committed to keeping textile waste from local landfills and promoting a greener tomorrow. For press inquires contact pr (at) atrsonline (dot) com.